Megan Tingley Books (Little, Brown), 2008. 756 pages. I admit it: There is no need for a review of Breaking Dawn. You should NOT read it unless you have read the three books that come before it: Twilight, New Moon, and Eclipse. Once you’ve read Twilight, you will know if you want to keep reading. If you do, then nothing I can say will stop you! However, I can’t resist the opportunity to offer my opinion. I liked Breaking Dawn. I loved the way she pulled off a happy ending, almost too happy, but still leaving me smiling. Okay, she threw in a completely bizarre plot twist. But I did like the way so many vampires came together, and I like the way this time Bella provided an important contribution to the final conflict. When I read the resolution of the love triangle, though, I laughed so loudly, I woke up my son, who was asleep on the other bed in the hotel room. Still, it did resolve things…. I’d better not say any more! These books may not be great literature, but they are absorbing reading, escapist romance, and a whole lot of fun. Harper Perennial, New York, 2006. First published in 1999. 250 pages. My son was right. I should have read the book before I saw the movie. The fact is, I loved the movie. One of my favorite movies ever. A delightful experience to watch. Yes, the book is wonderful. A fairy tale story that’s truly diverting. But can it be? I liked the movie better. Tristan Thorn grew up in the village of Wall, on the border of Faerie. There’s a story about his birth that some of the older folks in Wall know about. Tristan is trying to win the heart of his true love, when they see a star fall over in Faerie. Tristan promises to get it for her, not realizing that in Faerie, stars are beautiful women, daughters of the Moon. When Tristan finds the Star, she’s not happy about Tristan dragging her off to show his girl. Other, more sinister forces, are also after the Star, whose name is Yvaine. Tristan and Yvaine end up traveling a journey together with many perils. I’m afraid I found the original story less satisfying than the story in the movie. For the movie, there was a big climactic scene with a big showdown with everyone who is after Yvaine, and Tristan must defeat them. In the book, they seem to escape from most perils by virtue of simple luck. But the movie does show the same story — cleaned up a little. (The book is for adults, and contains a few “mature” details, which are cleaned up in the movie along with the more unified plot.) That story is truly delightful, in both its forms. Cricket Books, Chicago, 2006. 60 pages. I love this book! It takes the concept of “countability” which I learned about in upper division math classes and graduate school, and makes those concepts accessible and understandable for elementary school children! The numbers have certain games they like to play together, and there are certain quirks to the owners. Some more fun begins when Zero comes to visit and wants to stay, but the hotel is full. How could they possibly fit him in? Number One Million Two Hundred Thirty-Four Thousand Five Hundred Sixty-Six moves to Room 1,234,567, where he finds a bigger bed and is more comfortable. Room 1 is now empty, and Zero moves in and goes to sleep. All the other Numbers go back to sleep in their new rooms, and Mr. and Mrs. Hilbert go back to sleep in their old room. Only the cat by the fireplace does not go back to sleep, because she is trying to figure it out. This is only the beginning of the perplexities facing the cat at this amazing hotel, based on the work of great mathematicians Georg Cantor and David Hilbert. I find this book absolutely delightful! I wish it had been around when I was taking Real Analysis. 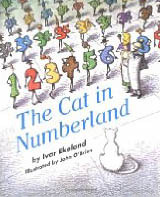 Or, better yet, when my little boy was obsessed with infinity, and kept inventing “numbers” that were “bigger than infinity.” I think he would have enjoyed this story. Megan Tingley Books (Little, Brown), 2007. 629 pages. This was my favorite book of the Twilight quartet, which is phenomenally popular now with teenage girls. I read it at the same time as a co-worker, just in time to read the fourth book of the series, and we had a lot of fun discussing it. If you haven’t read any books of the series, you definitely need to start with Twilight. Once you’ve read that one, you will know if you want to keep reading or not. Yes, they are vampire novels. But these are not typical vampire books at all. These books are for lovers of romance who don’t mind a little over-the-top plot situations. Edward is not the typical vampire, dark and evil. He and his “family” do not drink human blood, instead hunting large game animals. (Having read Barbara Kingsolver, I think that they would run out of wildlife on the top of the food chain in a very short time. But let’s not bring quibbles about reality into the story….) These vampires stay out of sunshine not because it would harm them but because they are too dazzlingly beautiful for sunlight. They are also super strong and super fast. With this group not drinking human blood, where’s the drawback? Eclipse explores more of the backstory of the vampires. We learn more about their history and motivations. Bella and Edward actually share some thoughts instead of just restrained passion. We learn why Bella doesn’t want to be a teen bride and why Edward is reluctant to let Bella become a vampire. They also explore more of Bella’s relationship with Jacob, her friend the werewolf. I like the way the way the werewolves and the vampires end up needing to work together. Here’s another fast-moving plot with plenty of tension, romantic and otherwise. This story was more unified than the other books. Instead of a crisis tacked on at the end, this one has a unified theme. Some young vampires are terrorizing Seattle, and it appears that, as usual, Bella is in danger. The entire book builds up to dealing with that danger, in a satisfying way. I still believe that a lot of the intense romance of these books is built into the restraint. Bella and Edward’s relationship is chaste, since to consummate it might kill her, but loaded with tension. I hope teen girls don’t read this and think there are boys out there who’d be able to sleep with them every night and have Edward’s self-control. But what a romantic dream — a strong, incredibly handsome, self-controlled, powerful protector whose love is for Bella alone. Throw in vampires and werewolves, and you’ve got a tremendous hit! Atheneum Books for Young Readers, New York, 2007. 316 pages. 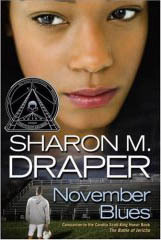 Sharon Draper is the author of the amazing and moving book, Copper Sun, a story of escaping slavery. November Blues begins as 16-year-old November Nelson discovers she is pregnant. She knows when the baby started, since it was the night before her boyfriend died. In some ways, this seems like just another story of teen pregnancy. It’s good, and it’s absorbing — the writing pulled me in so that I checked it out rather than shelving it at the library, and then kept me reading until early morning — but in some places the dialog and situations felt stilted and stereotypical. A teen pregnancy novel is a hard one to write. Because the situation itself involves thousands of teens, but a novel must focus on one particular teen. What happens to that one teen will feel symbolic of what happens to the other teens in that situation, and that’s a bigger burden than a young adult novel can necessarily carry. Taken as a story, this is a fun high school tale, with some sobering things to think about. The no-good backstabbing popular girl gets her comeuppance, and November learns who her true friends are. November has to choose between keeping her baby and giving the baby up to her dead boyfriend’s rich parents. I found myself wanting to shake them and say, “Isn’t there an alternative? Can’t you let November keep the baby, but provide her support and be a huge part of your grandchild’s life? Does it have to be all or nothing?” Again, this was one particular story, but the situation felt so prototypical, I found myself wanting the author to present all possibilities, more than I would have cared in a novel about, say, choosing between a career in art or science. An enjoyable story about a typical teen in a difficult situation. HarperCollins, 2000. 3 hours, 3 compact discs. There is a door in Coraline’s apartment that leads to a brick wall. Once it led to another flat, but when the house was split into apartments, the door was bricked up. However, one day Coraline follows a shadow through that door. 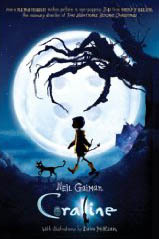 She finds there a woman who says she is Coraline’s other mother. She wants Coraline to stay with her forever, and has some wonderful inducements. But they turn out to be less and less wonderful. Everyone on the other side has black buttons where their eyes should be. Things look normal, but turn out to be seriously disturbing. And leaving the other flat is not as easy as entering. Neil Gaiman’s performance of this story is wonderful, enhanced by the incredibly creepy songs of The Gothic Archies. I chose this book to listen to on our trip to Florida because I thought my 14-year-old son would enjoy it, too. I do think I found the story creepier than he did. But tremendously well-written and well performed. Highbridge Audio, 2005. 6 hours on 5 compact discs. The Truth brings the Lionboy trilogy to a most satisfying conclusion. In the earlier books, Charlie’s parents were kidnapped, and Charlie went after them. In the third book, Charlie is the one kidnapped. His parents and the friends he has made along the way come to his rescue, but in the end Charlie’s own ingenuity, courage, and loyalty save the day for far more people and animals than just himself. There are a few outrageous coincidences in this book, as there were in the earlier books. However, it’s all in good fun. This is a rather wild adventure tale set in the near future. The action takes Charlie across the globe to the very seat of the sinister Corporacy. Charlie can still talk to cats, and in this book he becomes better acquainted with Ninu, a chameleon who can not only take on the colors around him, but also the languages. With Ninu’s help, Charlie can talk to any person and any thing. Like the rest, this makes good listening material, and would be great for a family car trip. There is plenty of action to keep you diverted, and once again the narrator has a delightful voice (and accent) to listen to. When Uri Shulevitz was a boy, he and his family were refugees from Poland. This vibrant picture book tells a simple story. One night, when they were hungry but had little money, Uri’s father went to the market. Instead of buying bread, he came home with a large map of the world that brightened up one wall of their little room. Candlewick Press, Cambridge, Massachusetts, 2008. 74 pages. Here’s another book perfect for a beginning reader who’s ready for chapters. 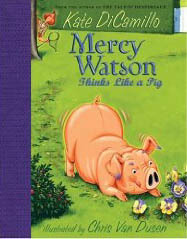 Mercy Watson Thinks Like a Pig has 15 very short chapters. The pages are loaded with colorful, hilarious illustrations. Mercy Watson is a pig, a porcine wonder. She is treated like a person by Mr. and Mrs. Watson, but sometimes she indeed acts like a pig. For example, when she smells the flowers her next door neighbors have planted, she can’t resist eating them. This prompts Eugenia Lincoln to call Animal Control Officer Francine Poulet, who has never dealt with a pig before. In the hilarious chain of events that ensues, you can be sure that Mr. and Mrs. Watson retain their shining faith in their sweet Mercy, and that there is plenty of buttered toast. You are currently browsing the Sonderbooks blog archives for August, 2008.